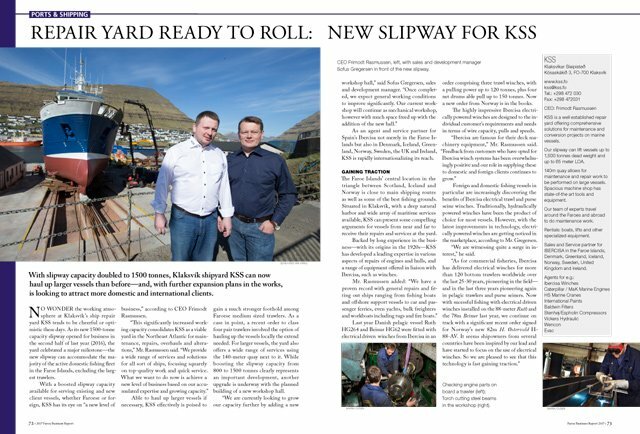 With slipway capacity doubled to 1500 tonnes, Klaksvík shipyard KSS can now haul up larger vessels than before — and, with further expansion plans in the works, is looking to attract more domestic and international clients. No wonder the working atmosphere at Klaksvík’s ship repair yard KSS tends to be cheerful or optimistic these days. 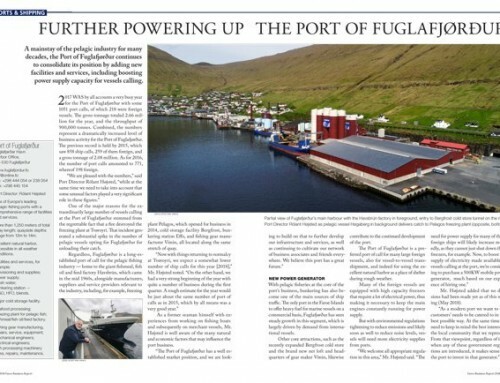 As its new 1500-tonne capacity slipway opened for business in the second half of last year (2016), the yard celebrated a major milestone—the new slipway can accommodate the majority of the active domestic fishing fleet in the Faroe Islands, excluding the largest trawlers. 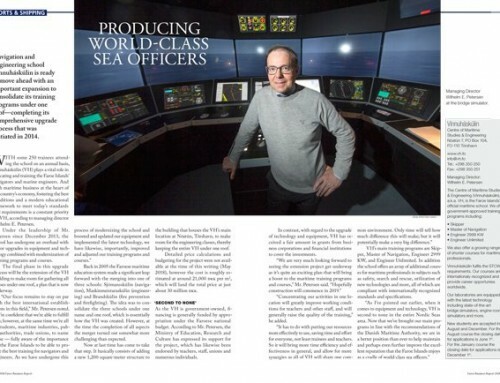 With a boosted slipway capacity available for serving existing and new client vessels, whether Faroese or foreign, KSS has its eye on “a new level of business,” according to CEO Frimodt Rasmussen. Able to haul up larger vessels if necessary, KSS effectively is poised to gain a much stronger foothold among Faroese medium sized trawlers. As a case in point, a recent order to class four pair trawlers involved the option of hauling up the vessels locally to the extend needed. For larger vessels, the yard also offers a wide range of services using the 140-meter quay next to it. While boosting the slipway capacity from 800 to 1500 tonnes clearly represents an important development, another upgrade is underway, with the planned building of a new workshop hall. As an agent and service partner for Spain’s Ibercisa not merely in the Faroe Islands but also in Denmark, Iceland, Greenland, Norway, Sweden, the UK and Ireland, KSS is rapidly internationalizing its reach. 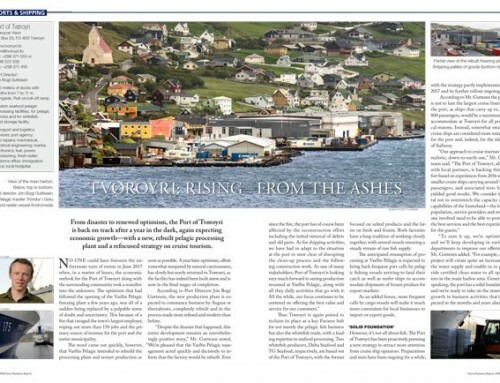 The Faroe Islands’ central location in the triangle between Scotland, Iceland and Norway is close to main shipping routes as well as some of the best fishing grounds. 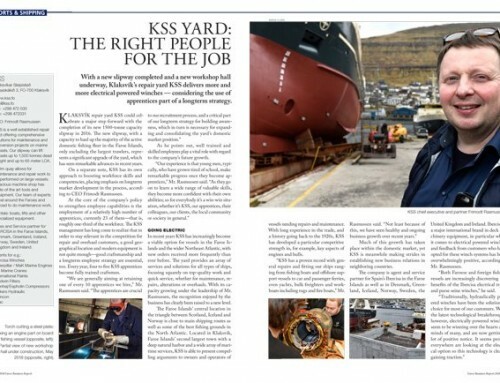 Situated in Klaksvík, with a deep natural harbor and a wide array of maritime services available, KSS can present some compelling arguments for vessels from near and far to receive their repairs and services at the yard. Backed by long experience in the business—with its origins in the 1920s—KSS has developed a leading expertise in various aspects of repairs of engines and hulls, and a range of equipment offered in liaison with Ibercisa, such as winches. Last year Danish pelagic vessels Ruth HG264 and Beinur HG62 were fitted with electrically driven winches from Ibercisa in an order comprising three trawl winches, with a pulling power up to 120 tonnes, plus four net drums able pull up to 150 tonnes. Now a new order from Norway is in the books. The highly impressive Ibercisa electrical powered winches are designed to the individual customer’s requirements and needs in terms of wire capacity, pulls and speeds. Foreign and domestic fishing vessels in particular are increasingly discovering the benefits of Ibercisa electrical trawl and purse seine winches. Traditionally, hydraulically powered winches have been the product of choice for most vessels. However, with the latest improvements in technology, electrically powered winches are getting noticed in the marketplace, according to Mr. Gregersen. 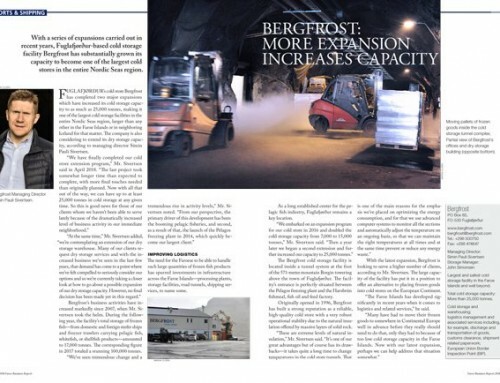 “We are witnessing quite a surge in interest,” he said.